Anthony Marchetti is a Minnesota photographer and photography instructor whose work focuses on how people interact with their urban spaces. Marchetti completed a BA at Gustavus Adolphus College and an MFA at the University of Minnesota. Currently, he is an Art Institutes International Minnesota full-time faculty member and also serves as adjunct photography instructor at both the University of Minnesota and Anoka-Ramsey Community College. San Ysidro, southern-most city in San Diego County on the U.S./Mexican border, hosts the world’s busiest land border crossing. At this site, Tĳuana receives and recycles San Diego’s discarded architectural waste, re-using and reconstructing materials into unique structures that offer new opportunities for living and working. 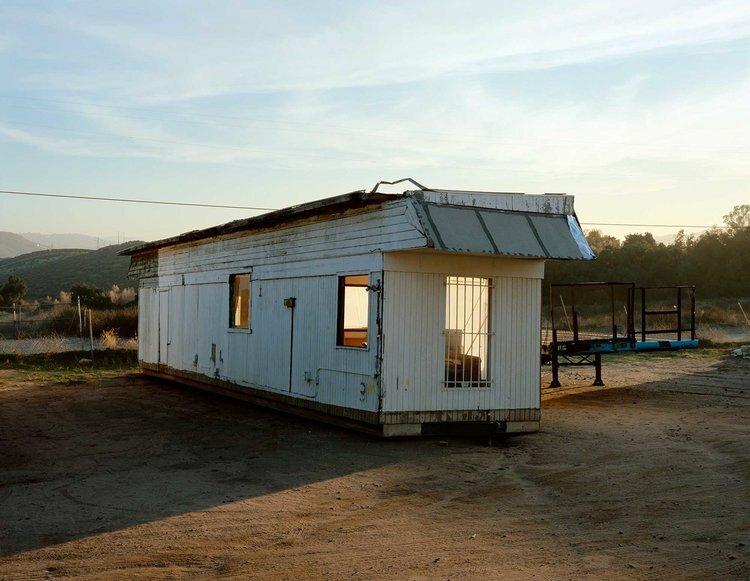 This photographic project focuses on this cross-border transmigration of building materials and small suburban homes from San Diego to Tijuana. Although located only 20 miles apart, few cities could be more different. San Diego calls itself “America’s finest city,” boasting some of the country’s wealthiest subdivisions, while Tijuana is viewed as decadent, transient and poor (as UCSD architecture professor Teddy Cruz describes it, “a contemporary Sodom and Gomorrah”). As building materials and small homes find their place amidst existing Tijuana neighborhoods, other transported homes are springing up in undeveloped outskirts surrounded by open desert or ringed by sparsely populated squatter communities. 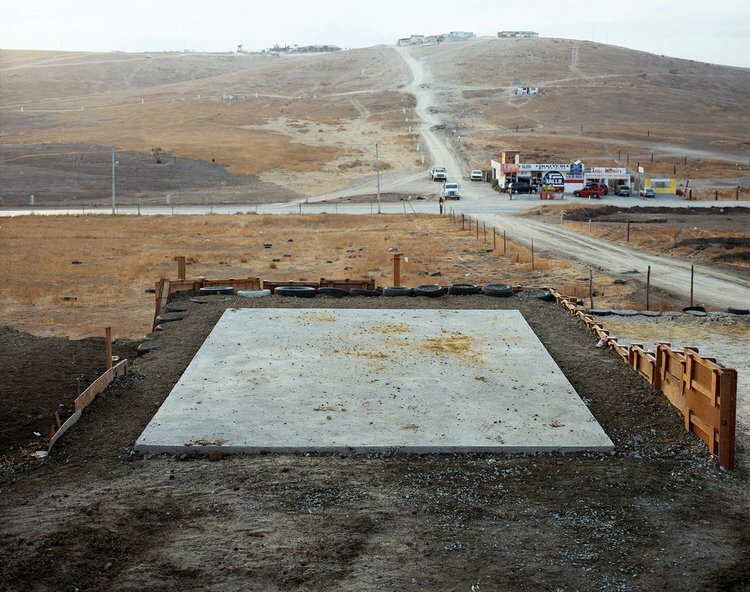 While these Tijuana images share affinities with Robert Adams’s mid-1970s work The New West, presenting newly developed tract homes against a barren western landscape, they also offer important differences. Adams documented the human imprint on the American landscape – a stark, expansive natural world, flattened and manicured to make room for tidy boxes providing practical living space, yet seemingly devoid of aesthetic. This project departs significantly from Adams in both intent and result. Adams’s images reveal the driving force of American commerce and expansion as residential developers cleared huge swaths of land to make room for entire neighborhoods. Growth at Tijuana’s edge is slower, seemingly more haphazard or at least devoid of a master plan. Instead, these images of small homes reveal individual desires to carve out personal space from a crowded urban center. They exemplify serendipity and intention, cultural originality and assimilation. As Tijuana grows and pushes at its less populated perimeter, development will fill the open spaces surrounding these transported homes. 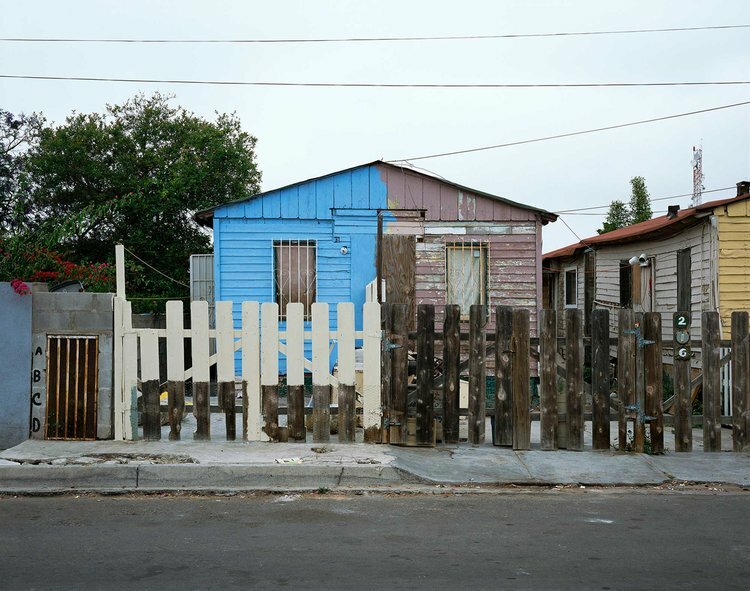 San Diego’s architectural refuse and discarded small homes represent new opportunities for low-income Mexican residents, and the project documents the cultural influences and ingenuity of grass-roots construction through re-use. By examining this process of transmigration, assimilation, and transition, I hope to reveal more about how people build, deconstruct, and reconstruct spaces in which they live and work, and how culture, expediency, and financial resources influence what is considered trash or treasure, waste or opportunity. The presented project was selected from a spontaneous submission made by Anthony Marchetti. Our aim is to disseminate and bring to light telling work of emergent or young photographers.